Do you pack up the holiday decor on December 26th, vacuuming up every last pine needle? Or are you the sort who still has ornaments around as Valentine’s Day is nearing? Most of us probably fall somewhere in between and a little skillful planning can make the transition smoother and more pleasant. I’m definitely closer to ‘team cleanup’, as I get to the point where the extra decor from the holidays begins to feel oppressive and I want a clean peaceful setting to rest my eyes on. That said, a few little holiday remnants during this phase can be still welcome. Here are some tips for making the transition seamless. Color is often the place I start and it’s key in this case. The first thing I remove is all the bright color, especially the reds, as I move into an icy pastel palette for winter. 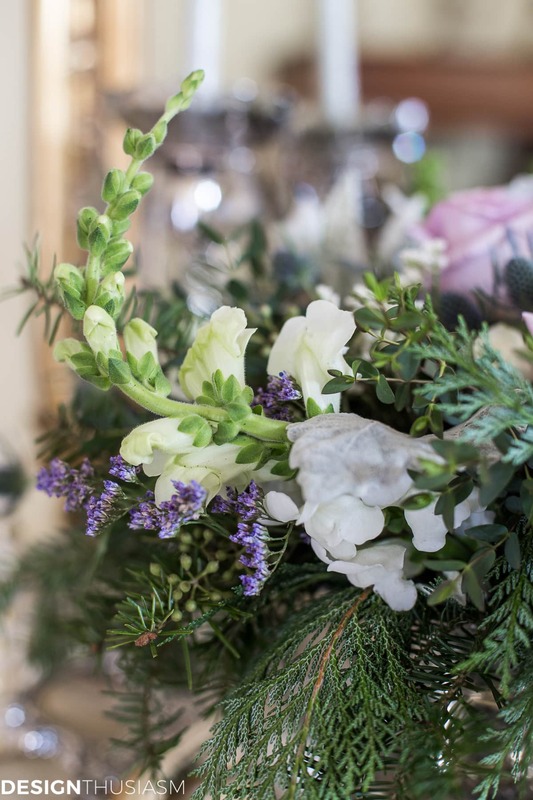 Touches of lavender or pale blue can look wonderful against a backdrop of white and cream. Some holiday greenery can stay at this early stage, although once we get into January I remove all signs of the holidays. I love to keep fresh flowers all year long and soft winter pastels work great for these arrangements. Along with a calmer palette I also move into a cooler palette, using lots of silver and greys, along with the whites and pastels. These smoky crystals maintain a festive air, albeit much more understated than the full breadth of holiday fare. A few subtle trees can remain at this time, quietly forecasting the winter that’s just beginning. 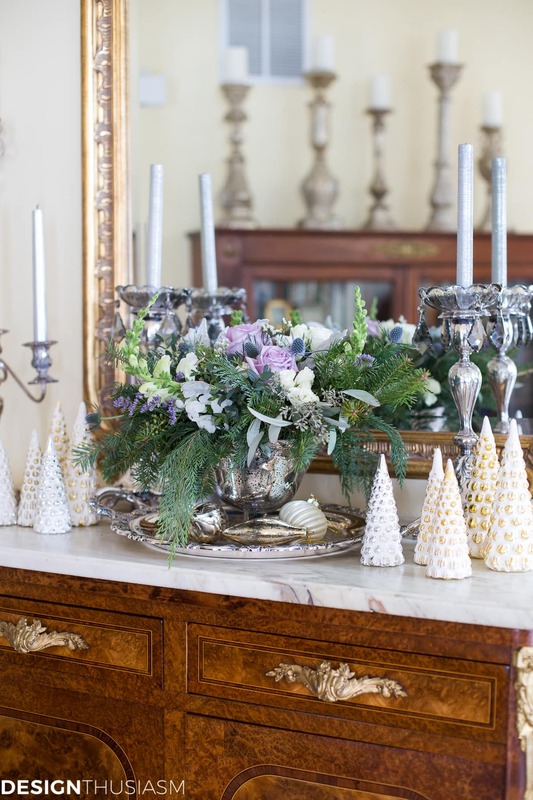 The lovely Snowy Glass Trees were sent to me from Love Feast Shop and look pretty flanking my winter floral. 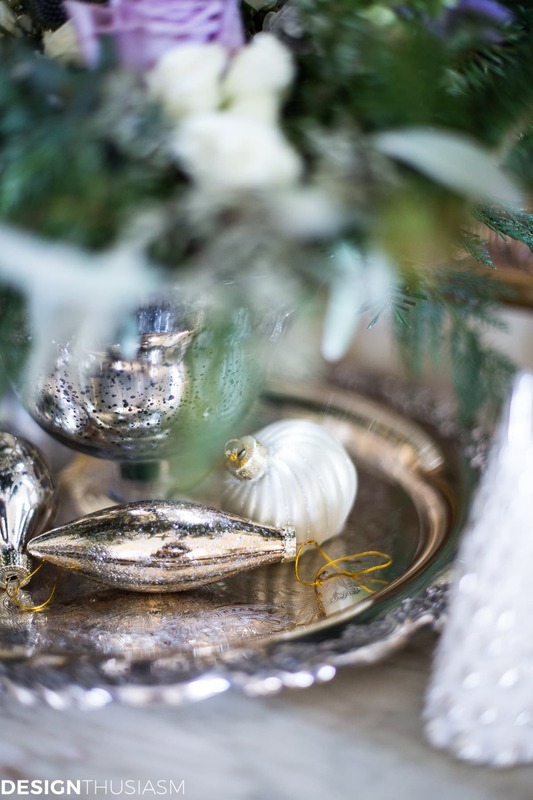 To underscore my cool colors and focus on silver, a few scattered ornaments can enhance the look. Like the greenery, once we move into January, these too will be put away, but for a gentle transition, a few silvery ones can stay for a bit. 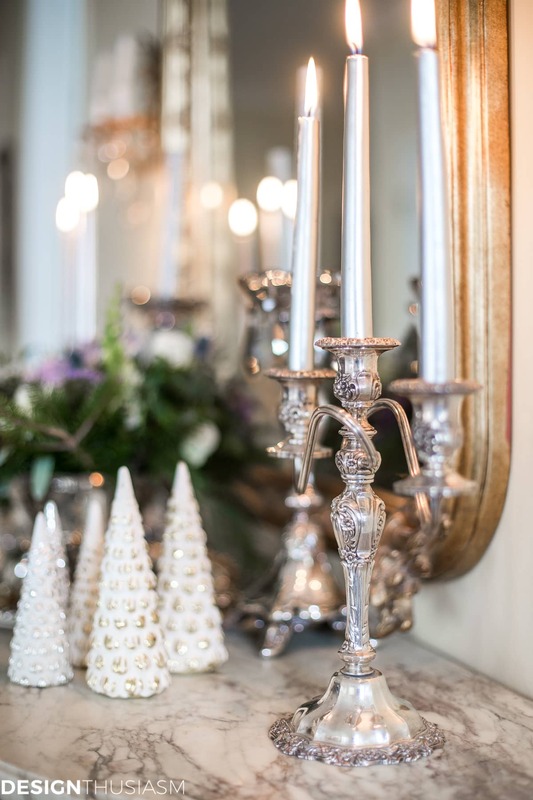 Mercury glass is perfect for January decorating and is lovely with creamy white and pale lilac. The silver platter is at home against the white marble, as well. Candlelight is always welcome in the winter months, along with a roaring fire in the fireplace. The balance I like to strike at this time of year is between icy colors and hints of warmth, and pretty soon I’ll be pulling out the sweater knit throws and fur pillows. The liberal use of silver gives me an opportunity to showcase some of my favorite vintage pieces. 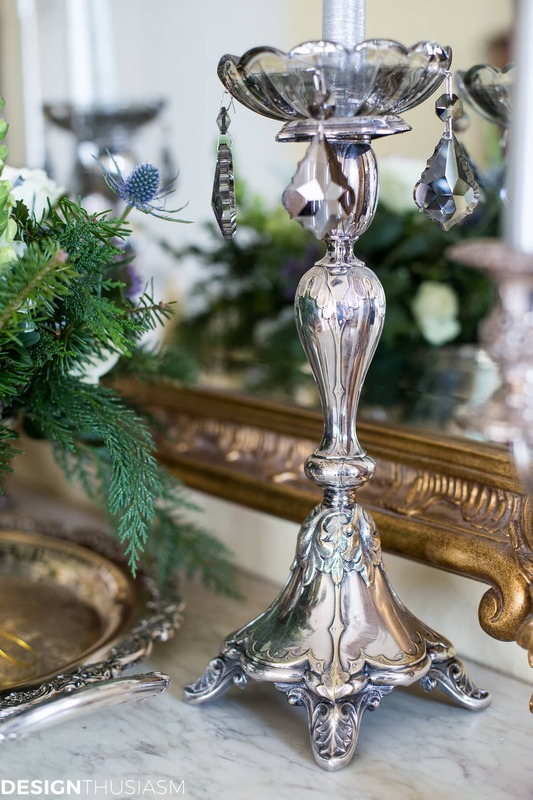 The delicate work on this candelabra is something that might’ve gotten lost among all the holiday flash, but in this serene setting it can really shine. 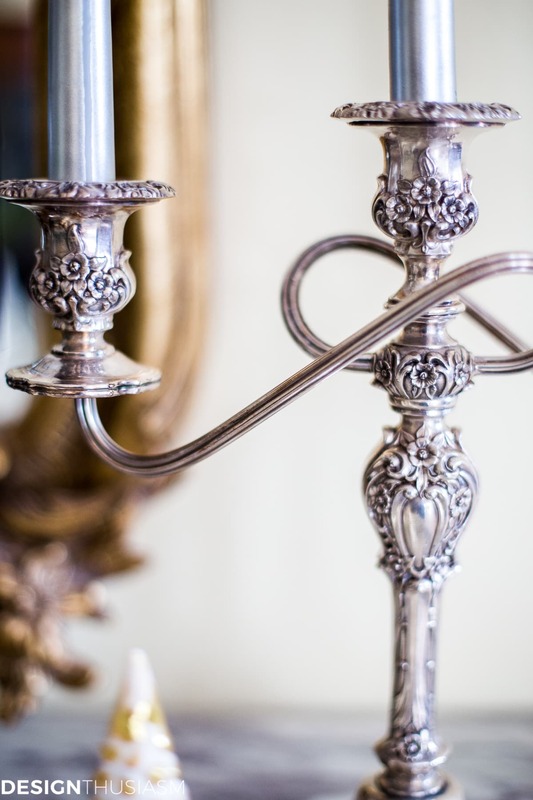 I use silver candles for extra shimmer. 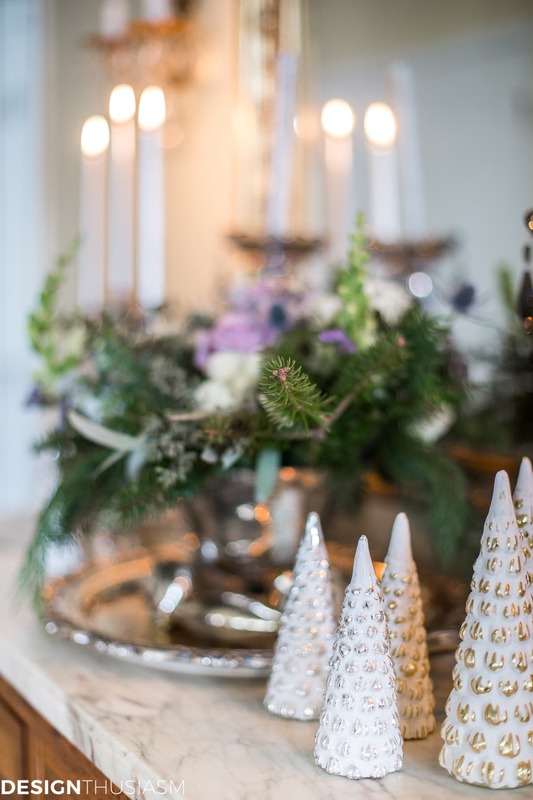 As the holiday season draws to a close, I look forward to an organized and serene home, but keeping out a few subtle remnants from the past few weeks makes for a calming and gentle transition. I tend to hibernate during the winter and it’s a time for resting and recharging. Peace. Calm. Quiet. It sounds blissful after a month of celebrations and parties! 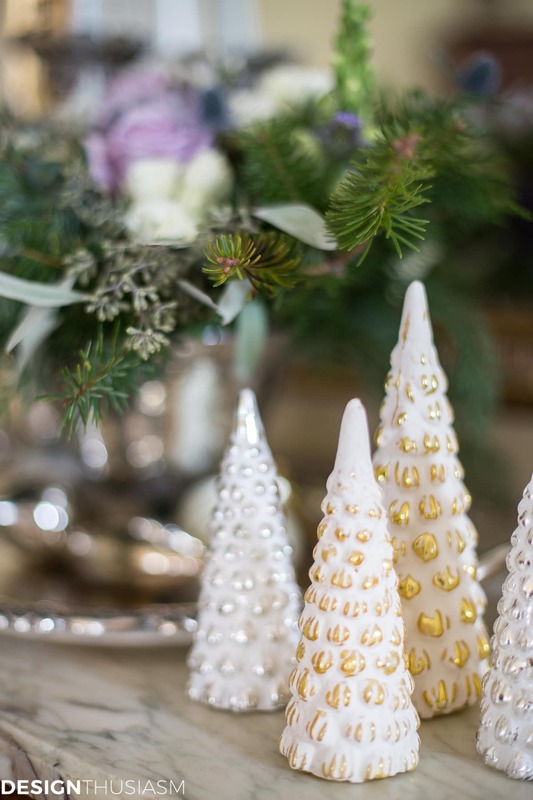 Winter Decor Source List – following are some products ideas to help you transition to winter decor after Christmas. 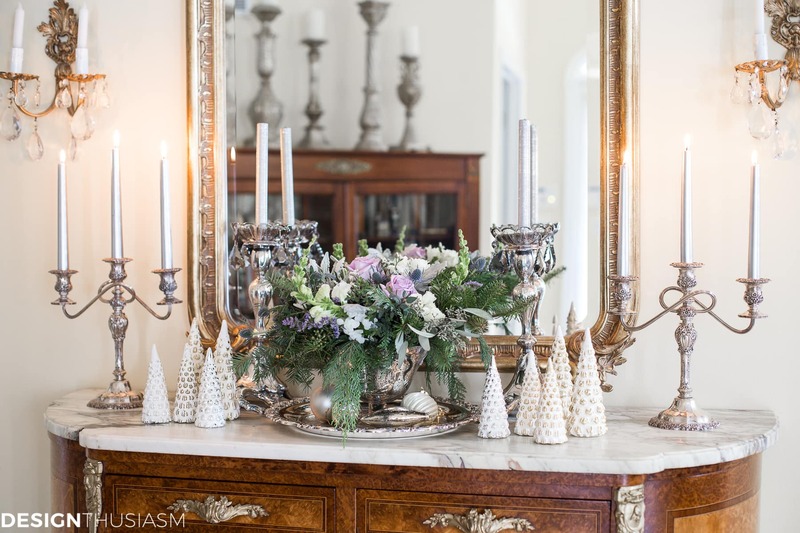 Love your transition from holiday decor to simple and elegant winter decor. When I was a child back in the ’50’s, we didn’t put up a tree until the week before, not three months ahead of Christmas. Taking down the tree around the New Year seems to be standard. 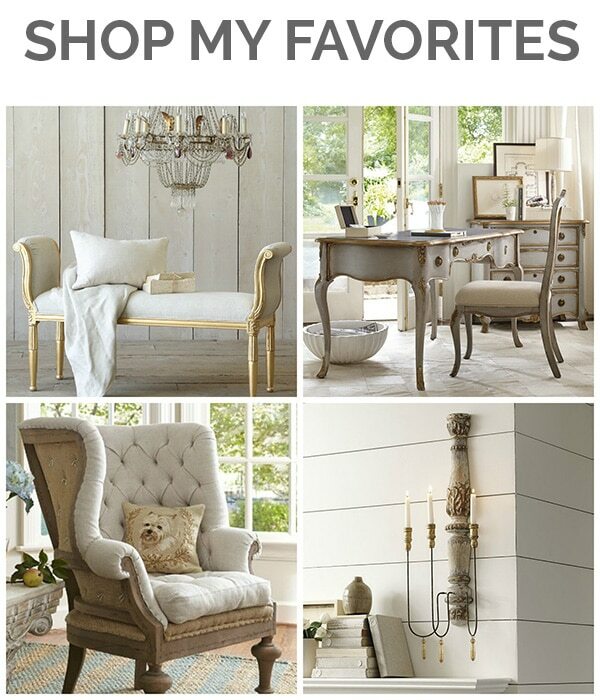 Your decor tips never disappoint! Ahhh, it’s peacefully beautiful! I’m taking down the tabletop tree today! 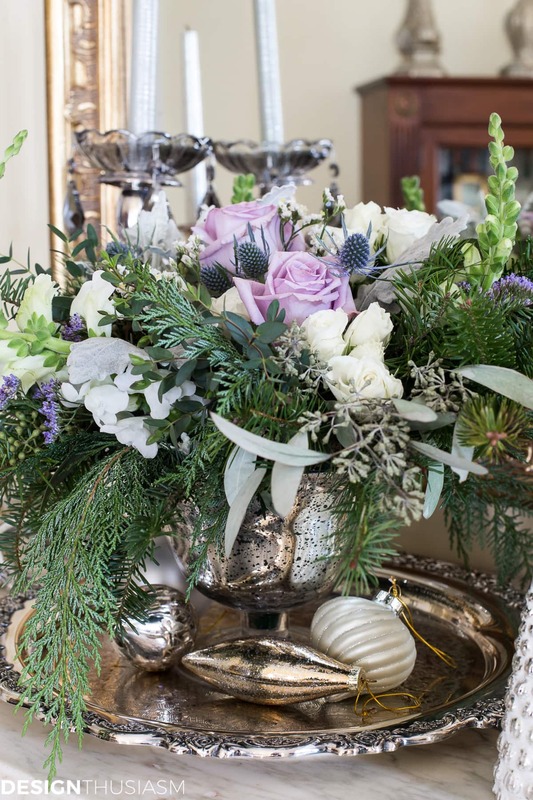 Have lavender Alstroemerias in silver pitchers on silver trays. Crystal candle holders out. The few blush and mercury glass ornaments will stay under cloches until next week. I’m so done with it! This is beautiful. I’ve been collecting some lavender and orchid items to put in my white bedroom this Spring. Now, I don’t think it can wait. Once again you’ve inspired me. Thank you and Happy New Year! 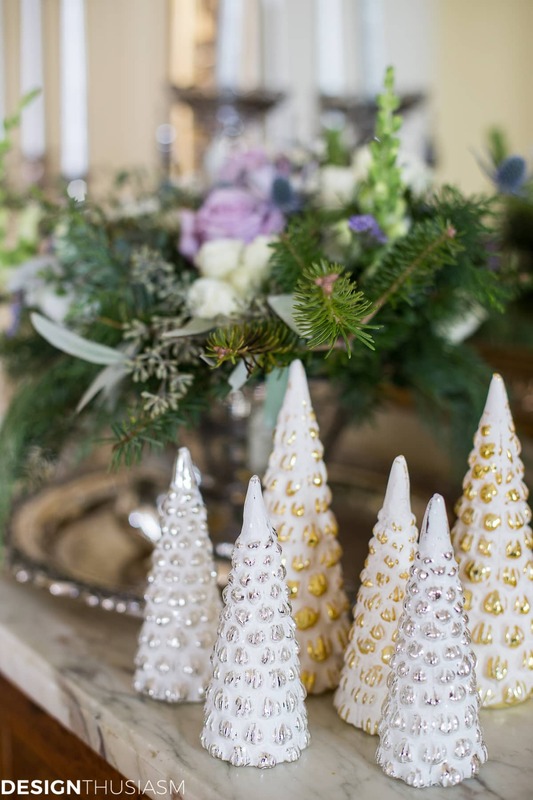 Where did you get the adorable little Christmas trees? They’re linked right in the post. Click on “snowy glass trees”. They’re from Love Feast Shop. The icy pastel color scheme is so pretty. Decorating for Christmas is one of my favorite things, but I also like cleaning up and putting Christmas away. Thank you for sharing at the Home Matters Linky Party. 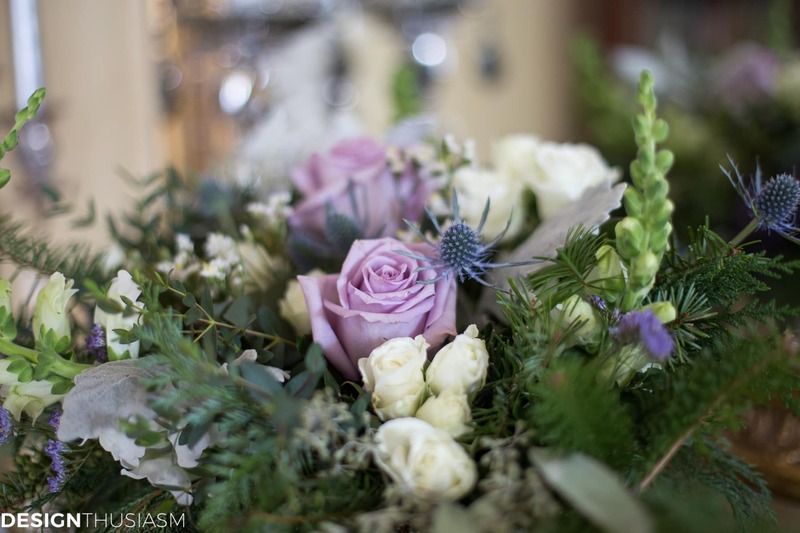 Lovely transition and great tips.I like the lavender idea – it looks very beautiful!